Man. It’s been a while since I published a recipe here on CR! Thank goodness that I have so many fun cookbook reviews and product reviews planned for this month, because my kitchen time has been limited these days. It’s not that I don’t make food; I do, all the time. It’s that I’m often rushed when I do it, often throwing together staples to make bowls or salads, and then when I do whip up something a little more festive for Steven and I to enjoy for dinner, it’s late and we’re hungry and I forget to take photos. Bad, bad food blogger. But anyway, fast & easy is the theme of my January when it comes to food. Steven and I will be traveling a bunch, visiting family this weekend and making an exciting trip to Telluride next weekend! (Friends of ours have generously invited us to stay with them for a couple of nights.) Our fridge hasn’t always been full of food, and my creative energy hasn’t always been tip-top. But my appetite and my tastebuds are as active as ever, so we’re still enjoying tasty meals on the reg. These tortillas are a perfect example of a recent meal that was oh-so-simple to put together, but satisfying and vibrantly flavored. I always keep flour or corn tortillas in the freezer for emergency breakfasts, lunches, or dinners–it’s so easy to create something simple with a tortilla base, and it feels a little more unusual than a sandwich or wrap. 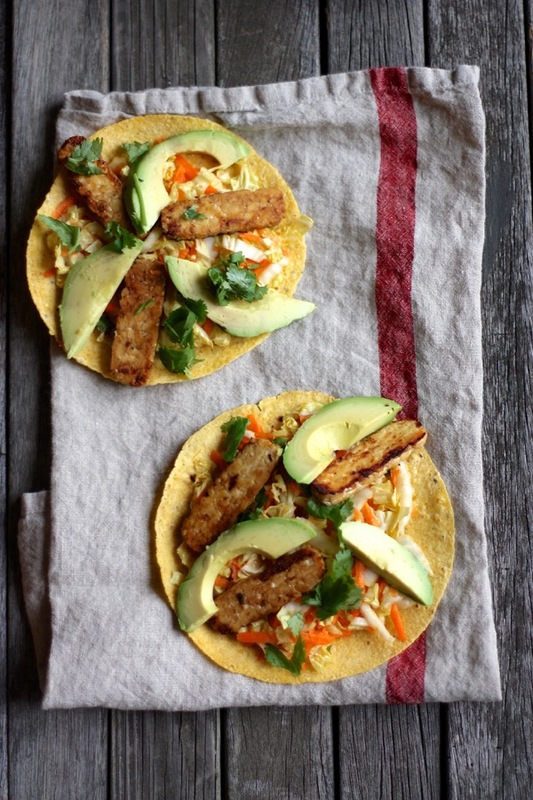 The nice thing about these particular tortillas is that they’re made with mostly seasonal ingredients that you may very well have at home right now; even if you don’t have napa cabbage, red and green cabbage are abundant at this time of year, and either one of them will work well. I love the contrast of cool, crunchy cabbage and salty, seared tempeh, and a sprinkle of cilantro is a nice touch if you happen to have some. 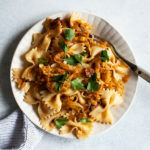 The tempeh in this recipe, by the way, is sort of my go-to stovetop tempeh. I prefer to marinate and bake it when I can, but if time is short and I decide to make some at the last moment, this is a flavorful and easy preparation method. To prepare the tempeh, heat the two teaspoons of oil in a large cast iron skillet or frying pan over medium high heat. Add the tempeh strips. Spray them with Bragg's (this makes things super easy) or drizzle them lightly with tamari. Wait until they're browning gently on the side facing the skillet, and then flip them. Drizzle with tamari or spray with Bragg's again. Once both sides of the tempeh are browning lightly, remove them from heat and set aside. 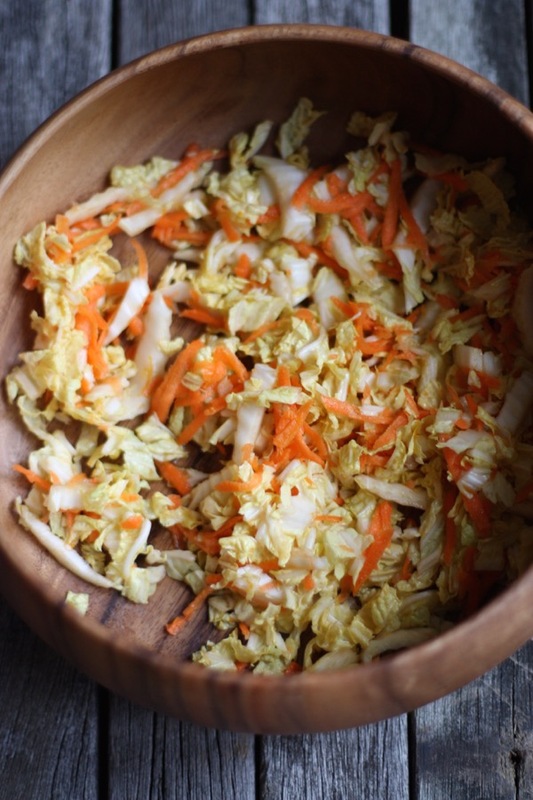 To make the slaw, throw the cabbage and carrot into a large mixing bowl. Whisk together the orange juice and zest, syrup, olive oil, salt, and pepper. Pour the dressing over the salad to taste (you may not need all of it). Toss the slaw together and add the cilantro. To assemble the tacos, layer about ⅓ cup over each tortilla. 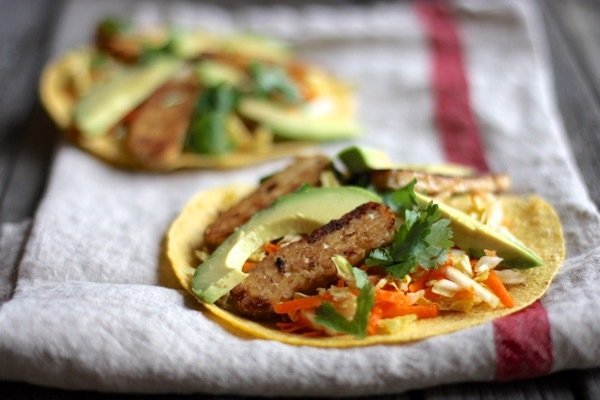 Cover them with a few slices of tempeh and a few slices of avocado, along with an extra sprinkle of cilantro if desired. Serve. OK, so maybe the avocado isn’t seasonal. But it’s super delicious. In the spirit of fast & easy, I’m keeping this post short and sweet. But I hope you’ll enjoy the recipe, and that it might become a stress-free lunch for you sometime soon. Tomorrow, a brand new (and wonderful) Green Recovery post. Don’t miss it.
) when rushed; I love this recipe, thanks for sharing 🙂 We have a friens who makes artisan tempeh, so guess what I’m going to do with our next batch?? Mmmm, artisan tempeh. Sounds fantastic. Ah, man, this looks fantastic!! 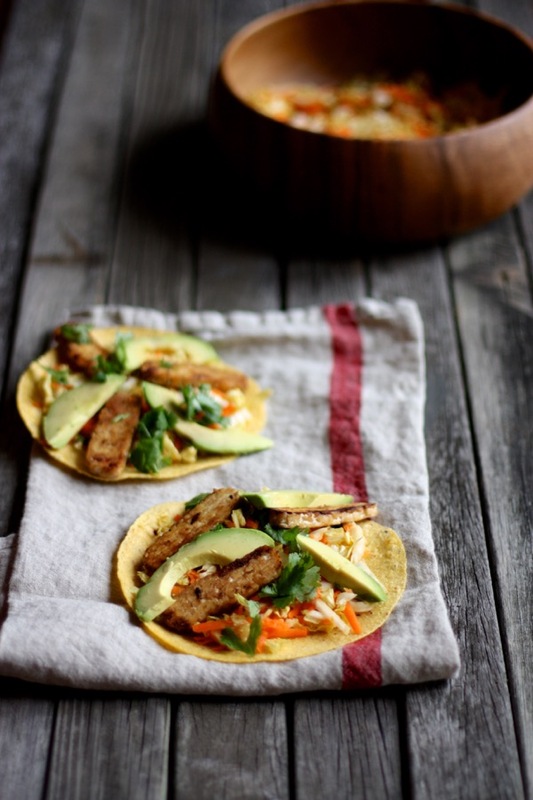 Anything with tempeh and avocado is a winner in my book! For sure. Such a winning combo! Oh man I can so relate. We have been trying to get to bed earlier and get up earlier so fast dinners have been our jam, and photo’s cut into that time:) Traveling sounds fun, I have no idea where Telluride is so I’m gonna look that up:) Ok but these taco’s look… awesome!! I’m a big fan of taco night or nacho night…do you guys ever do that? Wow, it looks fantastic! And as you described the recipe, isn`t so hard to make. I will try soon! Thanks for sharing. Glad you like it! Hope the recipe is a success! Mmmm these look so good! They really would make a perfect meal anytime of day. I think I will also start stashing corn tortillas in the freezer for quick meals. YUM!